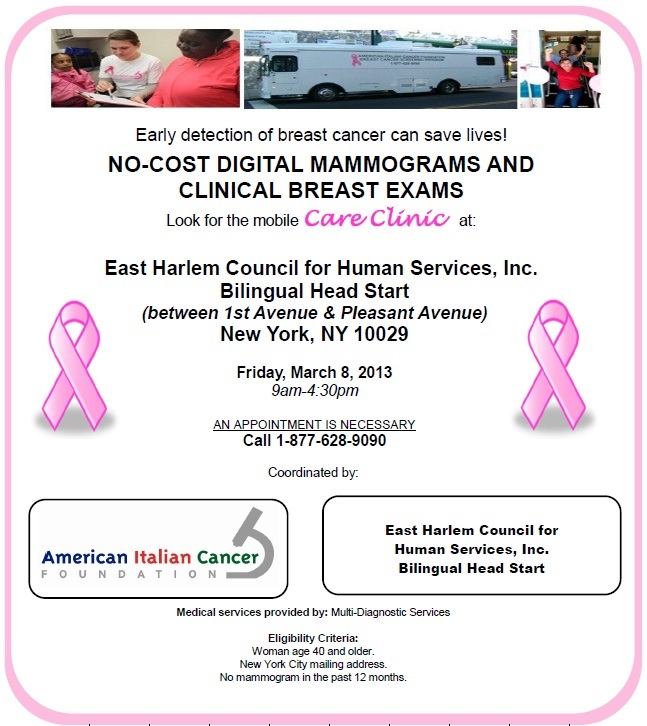 The American-Italian Cancer Foundation and Multi-Diagnostic Services (MDS) will be providing no-cost mobile breast cancer screening services to East Harlem on Friday, March 8th, from 9 AM to 4 PM. Early detection of breast cancer can save lives, so call to make an appointment today – (877) 628-9090. Your results will be sent to you and/or your doctor within 10 business days. Mammogram performed by a certified, licensed mammography technologist. Clinical breast exam and instruction in breast self-exam by a trained professional. Radiological interpretations performed by Board Certified Radiologists. You are recommended to wear a two-piece outfit. Please do not use any oil, powder, deodorant, or perfume in the breast, underarm or chest area. If you have Medicare, Medicaid or other health insurance, you must bring your card with you. Your insurance will be billed for services; however you will not be charged a co-pay and will not receive a bill. For women without health insurance, services will be paid for by the Screening Partnerships of the New York State Cancer Services Program (NYS CSP) or through generous contributions by the American-Italian Cancer Foundation’s donors. For more information about the NYS CSP, please call (866) 442-CANCER (2262). Comparison radiological studies are important. If you provide MDS with previous mammogram films, this comparison will be performed. In some cases, it can eliminate the need for additional testing. If you would like your results sent to your doctor, please provide MDS with his or her full name and address. This entry was posted in Blog, East Harlem, Events and tagged breast cancer, free, health, mammogram, women's health. Bookmark the permalink.